It is with deep sadness that the family of Retired Police Chief Joseph M. McCarthy announces his passing (July 28, 1925 to August 28, 2017). 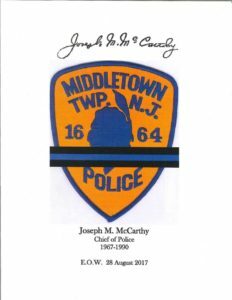 Chief McCarthy was born in Jersey City and moved to Middletown at an early age and graduated from the Middletown School system in 1943. He served in the United States Army during World War II in Army Intelligence, and was Honorably discharged in 1946. 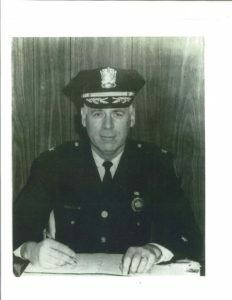 He joined the Middletown Township Police Department in 1954 and quickly rose through the ranks being promoted to Detective Sergeant in 1957, Lieutenant in 1959, Captain of Detectives in 1965 and was promoted to the rank of Chief of Police in 1967 and served in that position until his retirement in 1990. Chief McCarthy was a legendary figure in the law enforcement profession, and a leading member in the community. He dedicated his life to public service and worked tirelessly on behalf of the community he loved so dearly. He was a transformational leader and a prolific visionary who modernized the police department and built it into a highly respected professional agency. 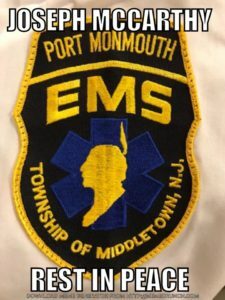 He championed many charitable causes and was a founding member of the Port Monmouth First Aid Squad, a member of the Port Monmouth Fire Co., The Middletown Historical society, The Boys Club, Middletown Helps Its Own, and many other civic organizations. remarkable individual and one of the most influential people of his time. He leaves behind an amazing legacy of achievements and good will, and he will be deeply missed by all he who knew him. Chief McCarthy is survived by his loving wife Kate of 72 years, along with his sons Joseph and his wife Kathy, Dennis, his grandchildren Colleen, Brian, Katie, Joseph and Sierra. In addition 9 great grandchildren. Our family wants to thank our cousins Paulette and Bernadette for their unending care and help. Visitation will be held Thursday, August 31, 2017, 4-8 pm at Mary Mother of God Church, 19 Cherry Tree Farm Rd., Middletown. Funeral services are scheduled for Friday, September 1, 2017 at 8 am at Mary Mother of God Church. A Funeral Liturgy will follow at 9:15 am at Mary Mother of God Church, 19 Cherry Tree Farm Rd., New Monmouth. Burial will follow at Fair View Cemetery, Middletown.